First, let us look at his claim that he cannot pronounce Sinhala words, at least some of them. This leaves him in the category of incapable, inefficient, untalented, unsuitable, incompetent people because he cannot pronounce English either, obvious isn’t it? 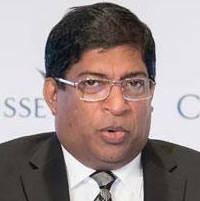 “Born to Tissa Anuruddha Mahanama Karunanayake and Carmaleka Karunanayake, daughter of former DIG Cyril Dissanayake. He is the eldest son in a family of two. 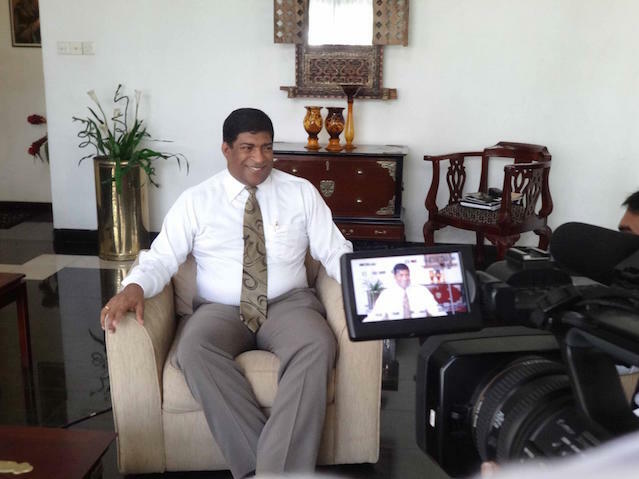 Educated at S. Thomas’ Preparatory School, Kollupitiya up to his GCE Ordinary Level, after which he proceeded to Royal College Colombo for his Advanced Level examinations. He became a management accountant and worked for Delmege Group before heading up several directorships of new ventures in the travel industry”. Wikipedia states that he is a Roman Catholic although his father’s name is very Buddhist. His maternal grandfather is a Dissanayaka, a typical Singhalese name. There is no mention of Ravi’s higher education at University level, local or foreign, if there is any. That leaves us with the billion Dollar question that how he cannot pronounce Sinhala words. Ravi was not born to native English speaking parents, he has not migrated to an English speaking country at a tender age, he has no education at a recognized educational institute in an English speaking country and he has not lived a considerable length of time in an English speaking country ( meaning over 20 years minimum). Linguists agree, if someone does not fulfill any of the above criteria he/she cannot speak English in the manner a native speaker would. In other words he/she will have a different pronunciation or an accent that is foreign to native speakers of English. Therefore in the context of his claim that he cannot pronounce Singhalese well he cannot pronounce English well either. I do not mean that he cannot speak English. He speaks our own brand of English. So our own brand of Singhalese would do for the reading of the budget. People of East Asia and the Far East do not have that subservient mentality to feel that they need to pretend that they do not know their mother tongue. The Chinese President on his recent visit to the UK received a grand welcome that no Sri Lankan could ever imagine receiving from the UK. Yet even at the queen’s banquet the Chinese President spoke in Chinese and I for one did not notice that he suffered from any inferiority complex for not speaking in English. Even the Indians have learnt to respect their own languages. I have realized that all dignitaries and the celebrities visiting foreign countries have begun to speak in an Indian Language. They even believe that the place that English holds today may diminish and people have to learn Chinese or Hindi instead. Be it reality or fantasy, I respect the fact that they do not feel their languages are inferior. The disease is rampant only in our tiny country. It is a shame that some people still do not realize that the knowledge of two or more languages certainly is better than knowing one and even that not fully. Recently I participated in a presentation in Colombo. The speaker had lived 27 years in the UK and of course had received his post graduate education in two British universities. During his presentation in Singhalese he did not use a single English word but fluent Sinhalese. At the same event another Singhalese person who had received only the local school education and lived all his life in Sri Lanka, speaking in English claimed that he is not capable of delivering his speech in Sinhalese. I did not know whether to laugh or to cry. We cannot simply forget it when political leaders follow this sort of ludicrous trends because in an undereducated and underdeveloped society like ours millions are prepared to emulate. Please stop pretending, every one of us should be able to speak Tamil or Singhalese and additionally English. I have no doubt you will speak your mother tongue better than any other language. The other fact is that reading the budget in your English can be easier for you, no argument mister. As a public servant you cannot ignore the fact that millions of people in our country do not understand if you do so. Therefore you should either become the Finance Minister of the UK, the USA, Canada, Australia, New Zealand and at least Nigeria or deliver the budget speech in Singhalese with a Tamil interpreter or vice versa. This fellow is an accounts clerk who can neither speak Sinhalese nor English. He has acquired a funny form of a Sinlish accent and had the balls to deliver an important speech in the parliament. No wonder many of his colleagues fell asleep during the session….LOL….!! Hal Paruwas of your kind cant see it further. He is only the ip of the iceberg of the cabinet that has a Ministry of Higher Education and Highways. As H paruwa – you sound to be on a personal grudge. He doesnot need to pronounce English as Brite would do, so long the content is clear to everyone. We are all not the same – everyone is an individuum. So, it is not okay to attack anyone based on his or her talents. What matters is if the man does the job well. That is it. For that purpose only we and the regime appointed him. It is a joke to hang on adding comments that go under the waist belt. Good luck people. Paruwa and his representatives should really be malicious by all nature. Our ex President even spoke Thamil so the Dalits can understand without going through Vellala translators. Still they organized the lynch party from Singapore with the help of GTF & BTF. Wonder whether our Defence counsel use that in plea bargaining at the White Court?. Will our Yahapalana translators convey the precise meaning of our Defence submissions to Hybrid Judges?. Because Sinhala is not an easy dialect to convert to spoken English, according to my Elders. Modaya like Sumnae can understand Buddhsit Sinhala Fundamentlists head Mahinda’s Engleese and tamilese. Bicose Sinhala is no-taneesi dilek to cone-vert to spawkan in-grees. It is regrettable that your article has a misspelling: fulfill. The correct spelling is of course fulfil. Maybe it was a typing error, but a diligent proof reading should have taken care of it. Given the title of your article, I thought it would be appropriate for me to point out your mistake. The moral of the story is: We all are fallible! What these ‘Kalu Suddhas’ don’t realise is that when they speak in English, the real English people can hardly understand what they are saying. Sri Lankans speak a very localised version of English with a peculiar accent (ask any Englismn/woman). In fact listening to PM Ranil speak in English sounds really funny – his Sinhalese is also child-like. Other ministers too when they speak English, they too sound odd. So there’s no need to feel pompous about speaking Sri Lankan Slinglish !!!!!!!!!!! By the way why are they wearing full Western suits in a country with a daily temperature of about 35C? Again PM looks like he is wearing suits two sizes too big for him – is he trying to hide his figure? As for Sri Lanka, most people who speak English as their primary means of communication (Private Sector, Banks etc etc) speak a perfectly understandable form. As a matter of interest, what did YOU wear when you last attended a wedding ? And if you have kids, what do THEY wear ? So what if he cannot speak Sinhalese or English well. The main question is can he do his job properly. I personally couldn’t care less who runs the country as long as they try their best to do what is best for the country. We Sri Lankans are always quick to criticise. Leave the man alone to do his job please. While I don’t believe that Ravi is very qualified the state of our economy is not his fault. The mess was created by the previous regime. What I dislike is the fact that Ravi appears to cover up existing problems and talks about “unconditional help” from the IMF and World Bank. Ravi can talk and make promises but in the near future organic manure will hit the fan. I think the writer is being unwantedly harsh! Many people despite being fluent in spoken sinhala do struggle with writing and reading. This is because it is rarely used by those of us outside the public service. I can very well understand the minister’s preference in using a language he is more comfortable with, especially when engaging in the arduous task of reading the budget speech. There is nothing to commend or criticise here…….that’s just the way our Colombo world works. Time we put a stop to the overabundance of these useless qualifications flooding the marketplace. They will thank you from the bottom of their hearts ! Similarly, I am appalled by this soi- disant pundit he claims to be, Helasingha Bandara is suffering from understanding satire written in simple language. Here’s the ACTUAL article for those of you who are interested in reading it. PS- Wikipedia is not a very good source to quote, my friend.